It can be surprisingly tricky to pick out a bathroom sink. Pedestal, vessel, undermount — where do you even start? 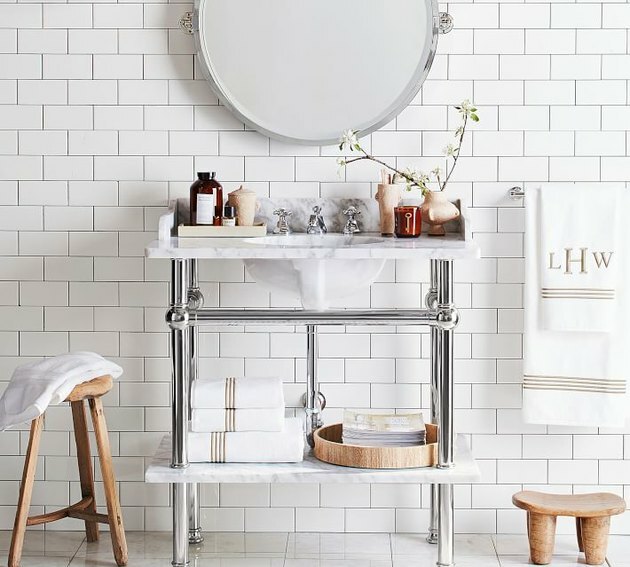 A sink should fit your personal style and the decor of the bath, but it needs to be practical, too. 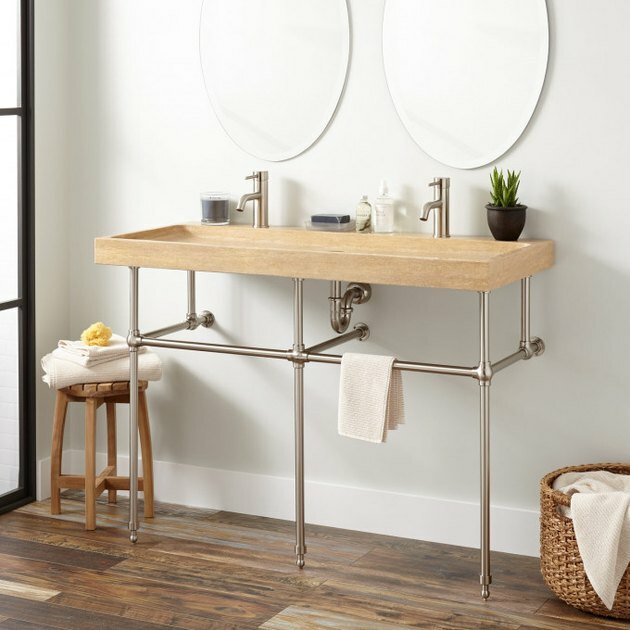 If you're searching for a basin that's modern and vintage-inspired in equal parts, look no further than a console bathroom sink. They often have brass and brushed-metal accents that scream throwback, but the legs make them seem fresh and unexpected. Plus, there's room to put a basket underneath, which is perfect for stashing towels and other essentials. 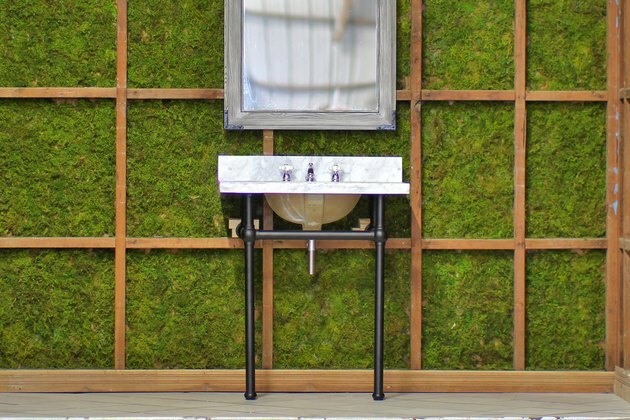 Here are 15 console bathroom sinks we're totally loving right now. With its sleek silver details, there is something about this console sink that's undeniably art deco in spirit. And the bonus? You can choose from granite, marble, and quartz for the countertop material, which will allow you to match it seamlessly with the rest of your bathroom decor. 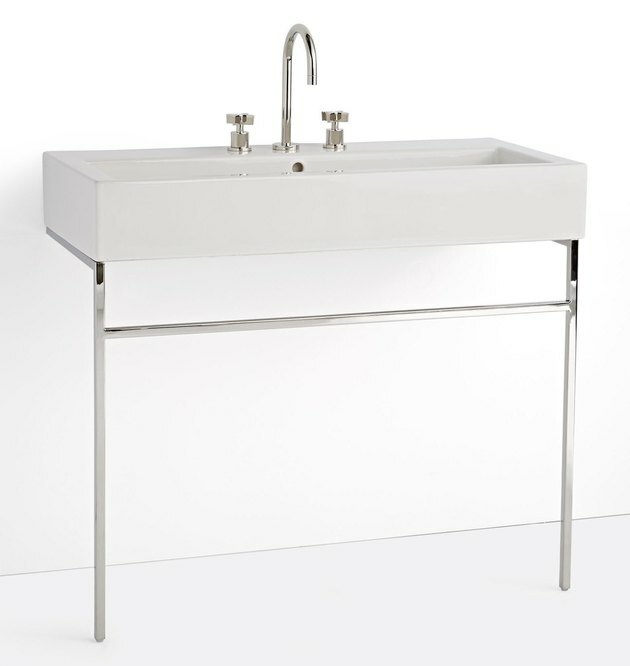 If you're going for a minimalist vibe, then this console bathroom sink is your match. 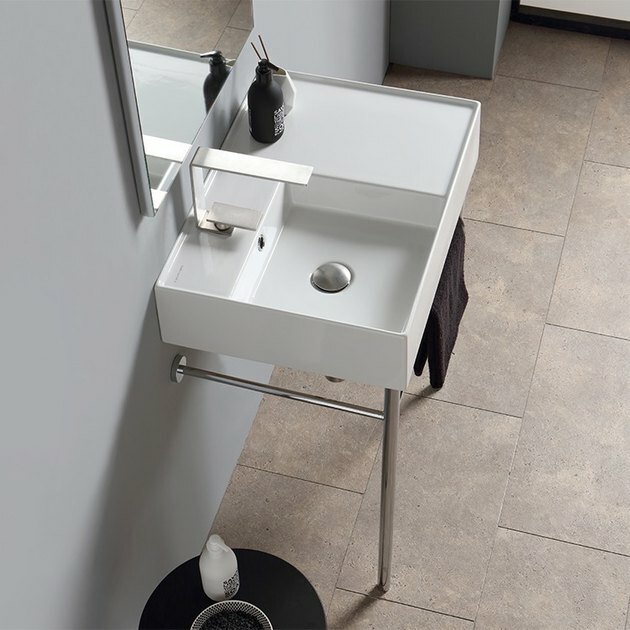 The white ceramic basin with industrial-style legs provides just enough visual interest without going overboard. 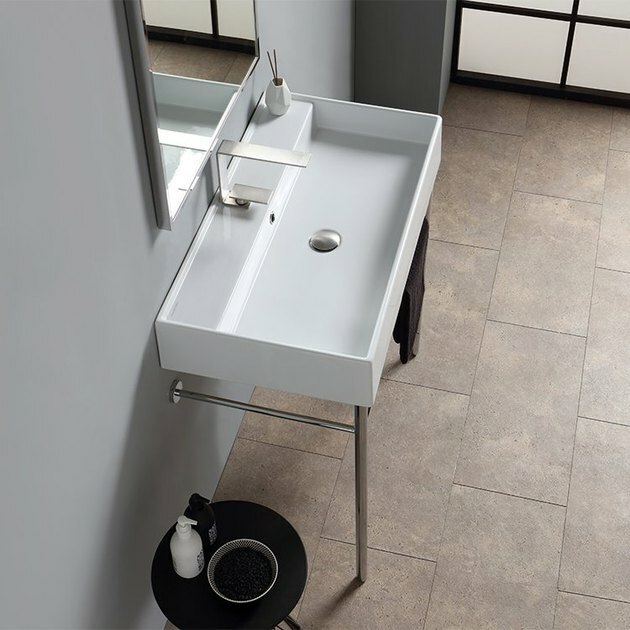 Rendered in clean lines and oh-so-modern styling, this ceramic sink, complete with a polished chrome stand, comes with a distinctive faucet that's sure to stand out in any bathroom. Prefer wood over metal? 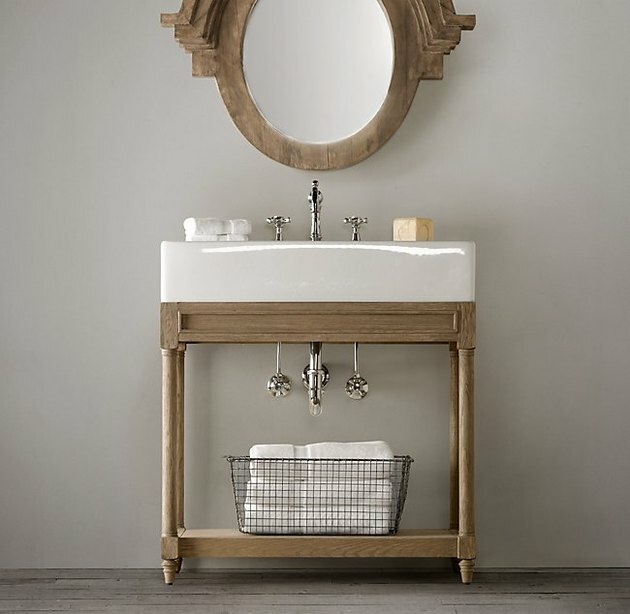 You're in luck with this oak console bathroom sink. Choose from the "Weathered Oak Drifted" or the "Aged Oak" finish to achieve a rustic farmhouse-worthy look in your bathroom. This stone trough sink also embraces natural materials, with a slab of stone that features its own unique details and variations. It's also a great alternative to installing double sinks in your bathroom. Going beyond the traditional 24-inch basin that single console bathroom sinks usually come in, this sleek modern option is unique, coming in at 32-inches. Sometimes you just have to go for the glamour, and the gold in this case. This sink, appropriately named "Southern Belle," is quite the attention-getter in dramatic vitreous china with gold chrome legs. 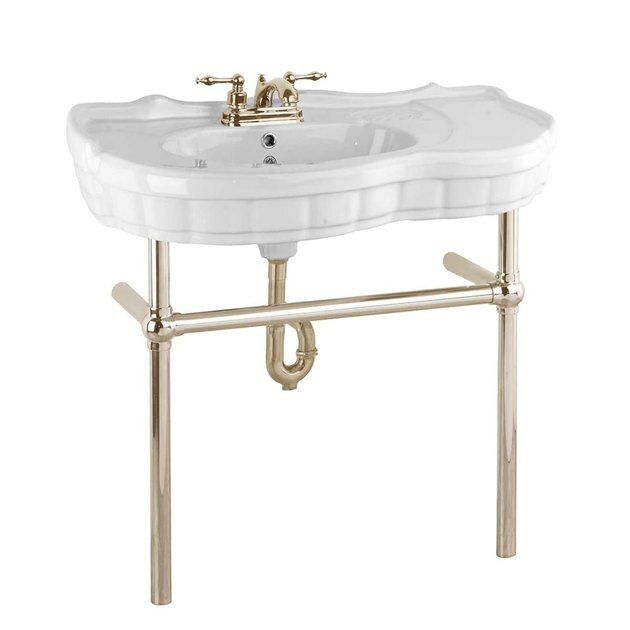 This console sink is built for two, complete with double basins, a polished silver stand, and a glass shelf underneath. You might start to believe that you're pampering yourself at a swanky hotel. Yes, it is possible for a sink to be practical and pretty, and this sink proves it. 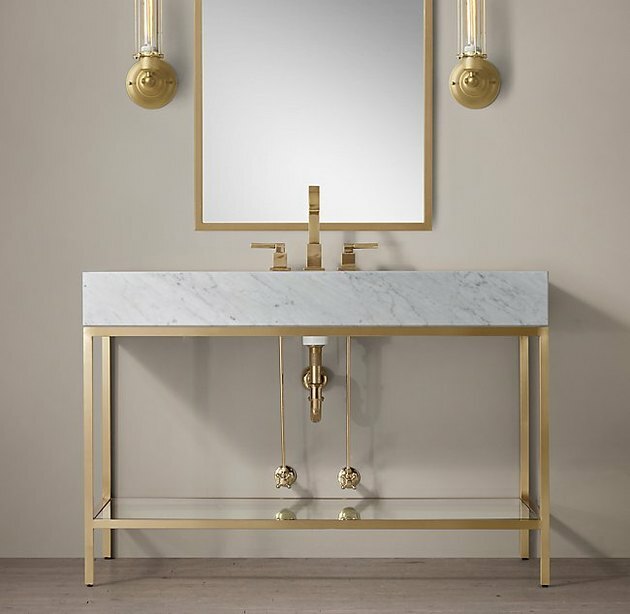 Here, it's pictured in Carrara marble and aged brass, but it can be customized in a multitude of ways — Italian crema marble, Belgian bluestone, polished nickel, aged steel — the possibilities are near-endless. 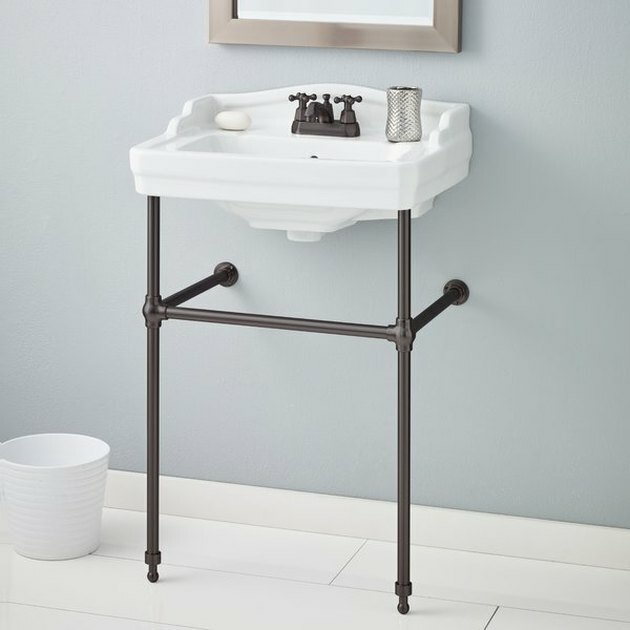 With a bit of a classic look, this console bathroom sink's ceramic basin seems like it's old-school, and then you spot the legs — modern-yet-industrial in black metal. The edges of this sink are just wide enough for a bottle of hand soap and beauty products that you want to keep within reach. It's also simple and will fit in with nearly every aesthetic. 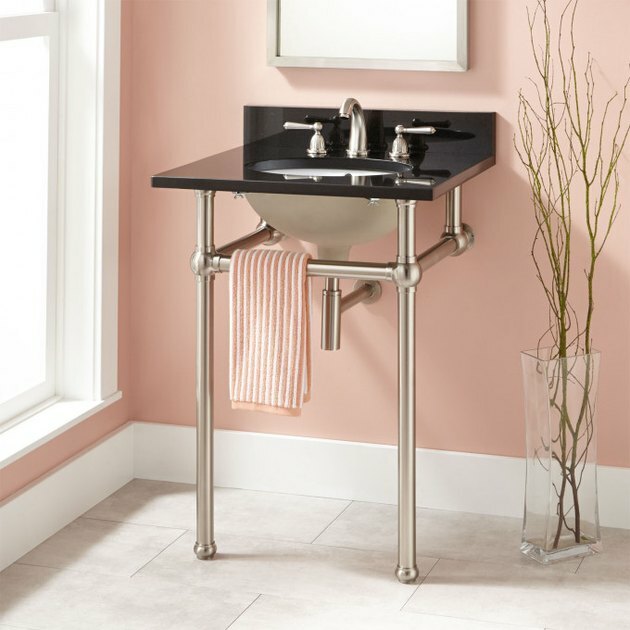 Coming soon to a Pottery Barn near you in early November, this sink is pure luxe with a Carrara marble top, polished nickel legs, and a bonus shelf underneath for storing towels or self-care must-haves. This console sink has a handy little feature — a towel bar, so you can dry your hands effortlessly without having to move an inch. It's not available to purchase online, but you can see it in person at your nearest showroom. 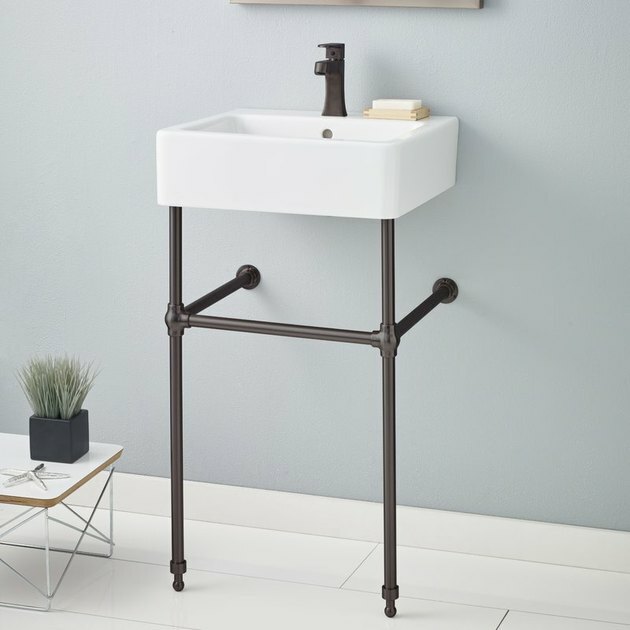 When you think of buying a sink, Etsy might not immediately come to mind, but as it turns out, the online marketplace has some pretty cool options. 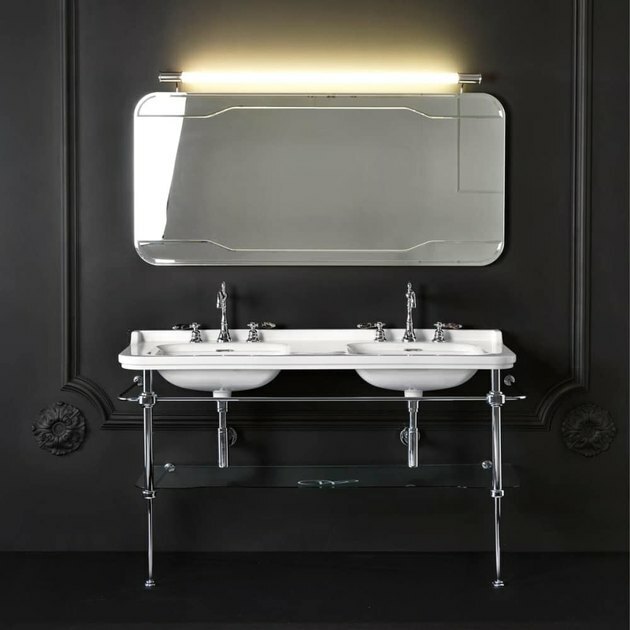 Case in point, this 1920s-inspired console bathroom sink made by Readytore, a Louisiana-based seller who specializes in creating sinks pulled from vintage designs. 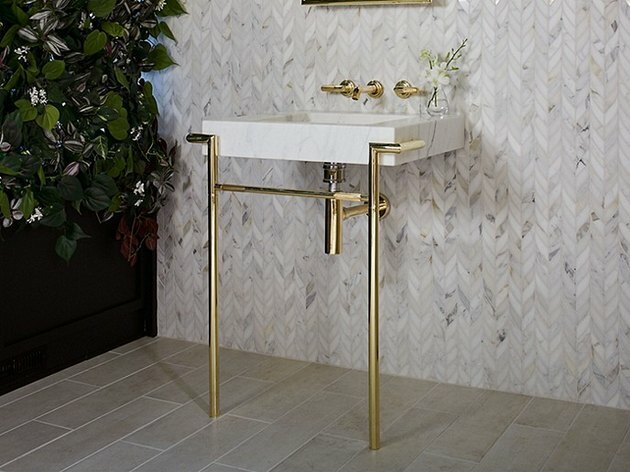 Marble is definitely the star of this bathroom console sink. 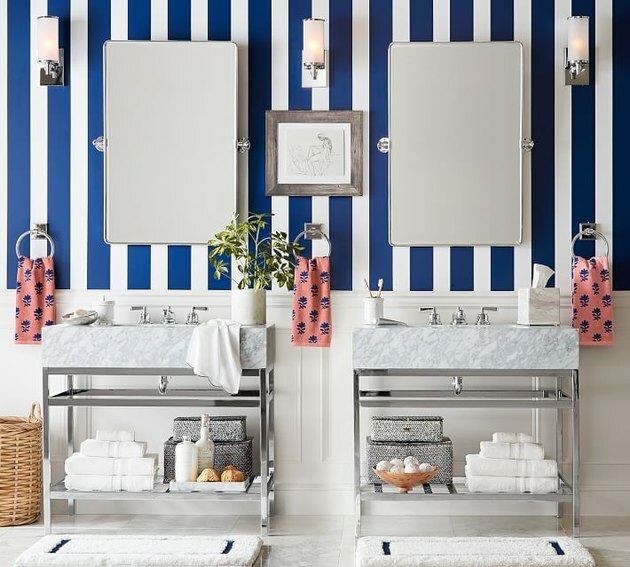 From beach houses to farmhouses, it will work flawlessly in basically any type of bathroom. And the shelf underneath serves as additional storage as well.